Nature, comfort and reception are the three words that best describe Camping Lou Cantaire. The site is located on a large hill, which makes for a very wide view. It also a short distance from the village of Fayence lies where there are several shops and restaurants. 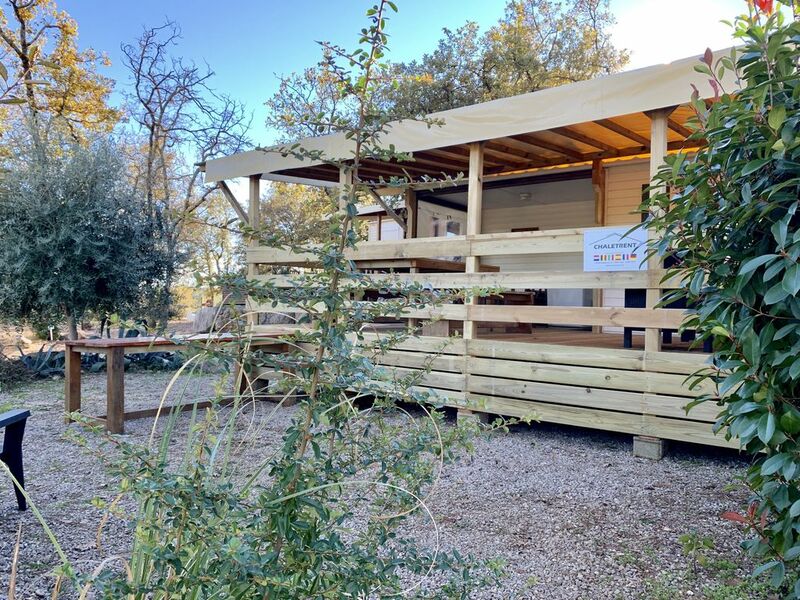 The caravan is one of the most beautiful places on cozy with panoramic views of mountains and forest, three star family campsite Lou Cantaire 'in Fayence (South of France), close to the French Riviera and towns such as Frejus and Monaco . The campsite has a swimming pool, tennis court, bocce, playground and restaurant on site. There is present in high season entertainment for children. There is WIFI for internet connection at the camp site for your laptop, smartphone or tablet. The mobile home is suitable for 4-6 people and includes: 2 bedrooms, shower, toilet, kitchen, dining / sitting area, covered terrace, satellite receiver with Dutch TV, and a very large garden with garden furniture. Furthermore, the mobile home is equipped with every inventory and utensils as you are used to at home. The camp itself has a swimming pool with slides, tennis court, fitness center, bocce, soccer, basketball, shop, restaurant, takeaway, laundry, game room and WIFI internet. There is also for the children in the summer an animation team on site. Fayence is in southern France about 35 km from the Mediterranean Sea and a short distance from the Gorges du Verdon and Lake St. Croix. The region offers a huge variety of possibilities for leisure activities such as rafting, mountain biking, hiking, paragliding and climbing. Water sports enthusiasts can indulge in the various lakes in the area and for cyclists and motorcyclists, the possibilities are endless. Cities Visitors can easily to Monaco, Cannes, Nice, Marseille, Aix en Provence and St. Tropez, but also people who draw full search the rest in this beautiful setting on them. In addition to all the sports and relaxation facilities at the campsite, it offers "Lac de Castillon" a short distance from the camp, all kinds of water activities. And of course a visit to the Gorges du Verdon, a 25 km long gap between Castellane and Moustiers-Ste-Marie is not missing on the border of the departments of Var and Alpes-de-Haute-Provence. - Within 25 km from Fayence: Restaurant / Swimming pool / Paddling pool / Tennis / Horseback riding 2 km / Bus stop 2 km / Place 5 km / Provisions 5 km / Bicycle 5 km / Lake 14 km / Fishing 14 km / Canoes for hire 14 km / Sea 25 km / Railway station 25 km. The beautiful Lake St.-Cassien, Located 14 km from the mobile home offers all possibilities for water sports: swimming, sailing, windsurfing, pedal boating, and fishing, in particular carp. There is a water sports school site and along the waterfront there are plenty of restaurants. We have the possibility to offer completely cared for fishing vacations, including boat, fishing rods and permits. We also have a guide at the campsite who knows everything about Lac Saint-Cassien.